Nationality: German. Born: Bischdorf, East Prussia, 11 December 1874. Education: Attended high school in Königsberg; studied law in Freiburg and Leipzig. Family: Married five times, including marriage to the actress Lyda Salmonova. Career: 1895—stage debut in theater in Rostock; 1906–20—member of Max Reinhardt's Deutsches Theater, Berlin: acclaimed role in Reinhardt's version of Oedipus Rex , 1917; 1913—film debut in Der Student von Prag ; often directed or co-directed his subsequent films; made propaganda films during the Nazi era; 1937—named Actor of the State; 1946—on stage in Nathan the Wise in Berlin and New York. Died: In Berlin, 1948. Möller, Kai, Paul Wegener , Hamburg, 1954. Staehlin Saavedra, Carlos Maria, Wegener, el doble y el golem , Valladolid, 1978. Obituary in New York Times , 14 September 1948. Giesen, Rolf, "Der Trickfilm," in Cinefex (Riverside), February 1986. Holl, S., and F. Kittler, "Abloesen des Streifens vom Buche," in Cinema (Switzerland), no. 41, 1995. "The essence of this strongly built, muscle-hard fellow is a straddling permanent manliness. Such a chap, who lives and lets live; in no way tender, yet basically good-natured; hot-tempered, yet also sly, a part Odyseus, but also a part Achilles—in short, a complete fellow." This description by Paul Wegener's contemporary Julius Bab captures a man whose physical presence is as commanding on the screen as it must have been on stage. Wegener's highly successful stage acting career spanned over 50 years; his work in film spanned 35 years and many roles as authority figures or characters with an abnormal bent. Although he never directed on the stage, Wegener's involvement in cinema went well beyond acting to include directing and writing. He explained his attraction to film as such: "I did not go into film as an actor; the problem of this new art form interested me in general. The mysterious possibilities of the camera kindled my fantasies. I conceived the fable Der Student von Prag because here was the possibility of acting opposite myself." On the stage Wegener was known for playing complex characters (Mephisto, Danton, Nathan der Weise); he then realized how filmic devices could be used to further the development of multifaceted characters, or in transforming characters. Wegener's first film, Der Student von Prag , suggests the essence of the great actor's contribution to film history: his fascination with the supernatural and the doppelgänger (the evil double of oneself), and the potential inherent in film to exploit both. Der Student von Prag is the story of a poor student who makes a Faustian pact with a Satanic magician. The devil figure takes on the student's mirror reflection as his part of the deal—an image that would become familiar as the Doppelgänger in many films to follow. The use of special effects combined with Wegener playing both roles created a haunting depiction of the evil lurking within one—a Romantic vision that Wegener brought forcefully to the screen. Wegener was responsible for carrying on the German tradition of adult fairy tales, as perfected in E. T. A. Hoffmann's novellas, by transposing them to film. Wegener created and acted in a series of fairy-tale films early in his film career, including Der Student von Prag , Rübezahls Hochzeit, Der Yoghi (in which he once again played two roles), and Der Rattenfänger von Hamlen . Wegener also directed two versions of Der Golem . In the second, Der Golem, wie er in die Welt kam , Wegener plays a clay giant brought to life, who is capable of unleashing powerful violence or gentle kindness. 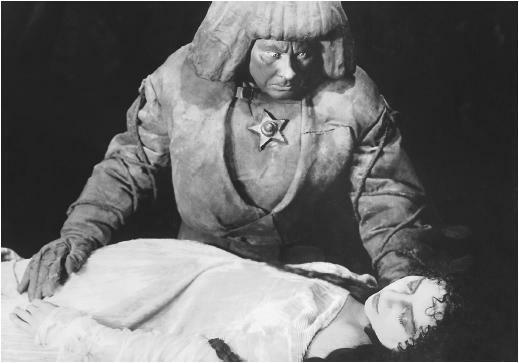 The role of the Golem offered Wegener the perfect opportunity to demonstrate his style of "discreet acting." He exercised restraint in physical movement, letting his face be the tool of expression. One of Wegener's favorite films was Lebende Buddha , in which he plays the role of Buddha. Indeed, Wegener's demeanor was not unlike that of the god's eternal smile; Wegener's face was an embodiment of expressiveness kept in check. Wegener continued to act until early 1948, although his passion and greatest creative output occured in the early films. His commanding presence extended to the total conception and production of these early films, and was not confined to the dramatic interpretation of his roles.